Via Con Dios is a wish to sail with luck. 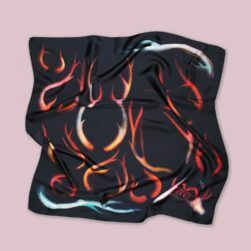 This scarf is inspired by the universal symbol of sailing. Here, the anchor is made of red flowers and water plants, gently hugged by a snake. Mythical mermaids, sea shells, red flowers, and a vivid frame of surreal blue corals make a deeper visual impact and leave us wondering about the existence of the Silviya Neri world.